I am so pleased to be sharing the first wedding and event inspiration board with you here on Unique Pastiche Events! My goal is to share at least one new inspiration board with you each week. Don’t worry, they won’t all be weddings. In fact, I plan on doing everything from weddings, to dinner parties, high end lux events to DIY based soirees, plus so much more! Each week I select a type of event and a theme. From there I develop a vision in my mind of what would make that particular occasion unique, memorable, and exciting for both the host and the guests. The next part is my favorite: image sourcing! I scour my Pinterest boards and the net to find various elements that would really help make up the event. Anything and everything from lighting, beautiful tablescapes, invitations, linens, party favors….you name it and I am probably looking for it! I try and find the images that best represent my vision, and combine them into one idea board (or a mood board for some people). After that is all done, you get to see my finished inspiration board right here on the blog, along with a little summary of my vision, and of course all of the links that I could find to the images. Now that we’ve gotten all of that out of the way….let’s get on to this week’s design. This week my inspiration challenge was to create a spectacular nighttime wedding. 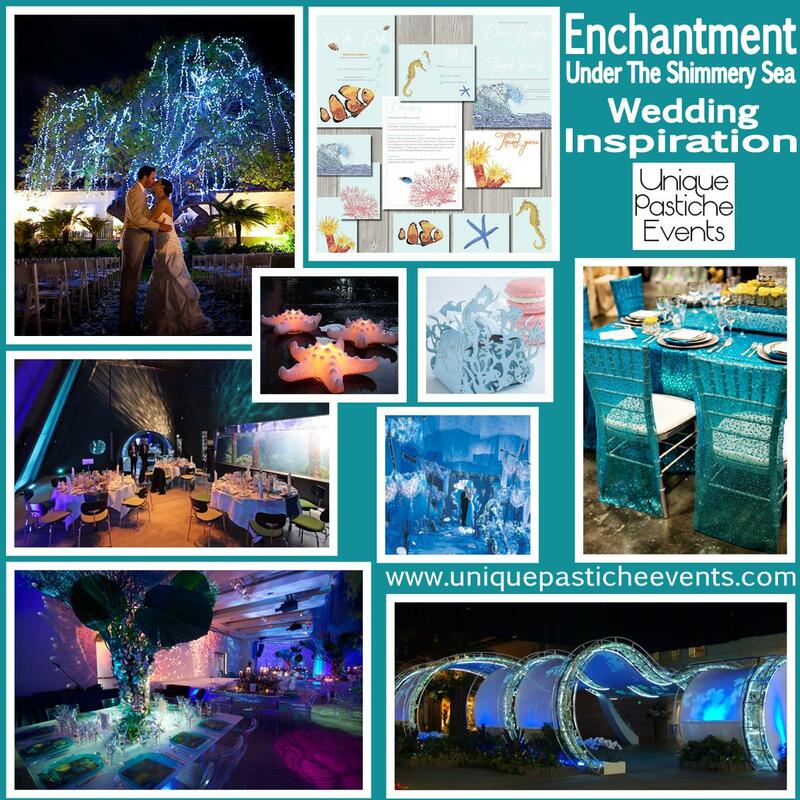 The theme would be “Enchantment Under The Shimmery Sea”, complete with a live band of course! It would be only natural to try and host this wedding at an aquarium if possible, but this design could be achieved in most ballrooms with the right team. A themed photo booth area is a must for this type of event, as well as the lighting. Lighting can make or break this type of wedding! Make sure to check out the original sources I’ve hyper-linked below. So tell me, what type of events would you like to see done? Any particular themes you’d like to see an inspiration board for? Let me know in the comments down below, or let me know on Facebook or Twitter!